Charlotte Observer reporter Sarah Aarthun wrote an in-depth article for yesterday's paper on the new venues opening at the NC Music Factory ("New uptown entertainment complex takes next big step"). Aarthun does her homework by not only chronicling the development at the complex, but she also details the impact two new music venues opening there--Uptown Amphitheatre and Fillmore Charlotte--might have on other local live music venues. The article mentions the setbacks the developers Rick and Noah Lazes have faced during the last few years in turning the massive old textile mill into an entertainment complex. But it stops short of making one very important point that I'm going to make here: It's too late for the NC Music Factory to fully become what the developers envision because it's taken too long to come to fruition, so the EpiCentre became what the NC Music Factory was supposed to be. Two music venues are opening this month at NC Music Factory. 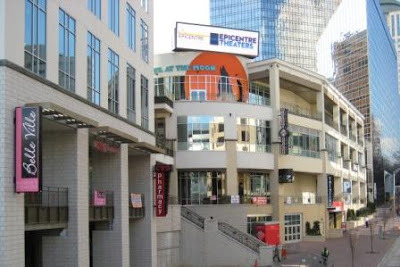 The EpiCentre has become the center of nightlife in Uptown. This is just my opinion based on what I've seen with this project since I moved here nearly four years ago. I believe the Lazeses are working hard and it's apparent that they've invested a lot of money, plus I want to see the Music Factory succeed because it will make Charlotte an even more exciting place. But here's the reason for my views. One of the first articles I wrote for Charlotte magazine included an interview with Noah about the Music Factory. He took me on a tour of the complex and it was clear that there was a lot of work to be done. This was in August 2005. He was telling me about all of these great things that were going to be opening "next summer." He was naming a lot of restaurants, bars, and nightclubs and while I don't remember the names of most of them, I'm pretty sure I remember him mentioning Dale Earnhardt Jr. If any of you've been to the EpiCentre then you know that Dale Jr. opened Whisky River there in April 2008, the first nightlife venue to open at the new Uptown entertainment complex. I believe this is one of the places Aarthun is referring to when she mentions in the article that "In recent years, potential tenants have chosen to open elsewhere, unwilling to wait for completion of the development." But the article doesn't say who those potential tenants were. The tour Lazes gave me nearly four years ago could've been a tour for the planned EpiCentre, in terms of the types of venues that were being talked about going there. I don't know who had their plans first, but Lazes was already a couple of years into construction before Afshin Ghazi even had the old Charlotte Convention Center torn down so he could build the EpiCentre on the land. As the saying goes, it's not how you start but how you finish. And today, the EpiCentre is one of the most talked about and envied entertainment complexes in the Southeast. Lazes has faced a lot of scrutiny and has had his share of doubters over the years, and I guess you could say that I'm doing the same here. But I'll also point out that Ghazi had his share of nonbelievers, too. I interviewed him for a quick update on the EpiCentre for the January 2008 issue of Charlotte magazine ("End Coming") and talked about how he was proving his naysayers wrong. The main difference between the developments with Lazes and Ghazi, though, is that about three years after breaking ground with construction, Ghazi had the EpiCentre filled with more than 20 restaurants, bars, nightclubs, a movie theater, bowling alley, and hotel. Lazes has only opened office space, a music rehearsal hall, a nightclub, and now, this month, two live music venues after about six years of construction at the Music Factory. Plus, Lazes is trying to forge ahead in the midst of an economic recession--the Music Factory's website lists Butter Lounge, Crobar, and Wet Willie's among the venues that are scheduled to "begin opening in 2009." I would be surprised if any of those actually opened this year. The NC Music Factory will eventually take shape, but I doubt if as originally planned. Then--with it and the EpiCentre--we'll have to see if Charlotte can support two visions of the same dream.